Welcome to the Friends of Woodhouse Grove - the Parents' Association of Woodhouse Grove School. As its name suggests, ‘Friends’ is all about getting to know other parents and having fun at the various events we hold throughout the year. In the process we raise a great deal of money, which is then donated to various groups and activities across the school – in the last 2 years some of the clubs we have donated funds to are; Art Club, Theatre, Music groups, Debating teams, War Hammer club and not forgetting our annual Leavers Awards. For new parents, senior school can be very different from primary school. The ‘cosy’ school gates are replaced by the school bus or a swift pick-up from the car park. Getting to know other parents can be a slower process. But one of the fastest ways to establish a whole new social circle is to come along to Friends events! For not-so-new parents, getting involved with Friends or supporting our events is a great way of meeting the wider school community, as well as helping your children get the most out of their time at The Grove. Friends meet a couple of times a term to plan and organise events. We have members from a range of year groups including Y7, plus three staff members – all headed up by our Chair, Lise Laycock. Our meetings are a social occasion in themselves, with refreshments provided. So why not join us, share any talents you may have, and help to organise and plan our events? Our meetings are informal and chatty, not at all stuffy or ‘cliquey’. Tea, coffee and biscuits (specially hand-baked by our amazing kitchen staff) are usually available. So, if you’d like to join us, just come along to our next meeting or get in touch via our contact form. Next meeting: Tuesday 6 November 7.30pm Hastings-Long Gallery, WGS. Last year we raised over £2,000 - see how these funds were spent below. Hopefully this year, with your help, we’ll raise even more! The money we raise goes directly to help your children by supporting a wide range of extra-curricular groups and activities. Woodhouse Grove is famous for its fantastic range of groups and activities held outside normal school hours. But of course these cost money. The money we raise goes directly towards these vital activities which enhance your children’s experience of The Grove. This is why we’re so keen to encourage parents to support our fund-raising events – and in the meantime have a fabulous time! Every year Friends provides money for an award to one or two senior pupils towards a worthwhile venture, for example charity work during a gap year. Our selection criteria reflects students’ overall contribution to Woodhouse Grove School, rather than simply academic achievement. This is what makes the Friends Award different from the other scholarships. The Award is open to all senior pupils, not just leavers. Applicants must demonstrate that they are involved in a broad range of activities and charity work, in or outside school. Applicants must also demonstrate commitment to the ethos of the school as well as providing evidence of having supported other members of the school in achieving their success. Why not help us to raise extra funds that benefit all our children at the same time without any extra cost to you? Friends of Woodhouse Grove (FOWG) have teamed up with The Giving Machine a shopping website which gives you access to hundreds of well-known high street shops, as well as some less well known ones. Once logged in, state Friends of Woodhouse Grove as the destination for money earned, you can then choose links to many major retailers and shop as normal. The retailer will then donate a percentage of the sale to The Giving Machine, who in turn log the money to our account. You can shop at places such as Amazon, Apple Store, Boden, Sainsbury’s, play.com, E-Bay, Next, Marks and Spencer, Debenhams, Joules, Ticketmaster and many more. The Friends of Woodhouse Grove have a presence at all major events such as Sports Day and New Parents' Evening, as well as holding various ad hoc events throughout the year. Friends events are great fun – and great value. Supper is often included in the price and the bar is usually open. 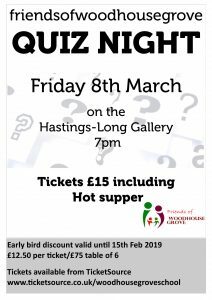 We hold quiz nights, wine evenings, and the annual Christmas Fair. Our events aren’t restricted to parents – friends and relations from outside school are welcome. Many of the staff are also Grove parents, so our events are a great way to meet them informally too. We welcome ideas for new events, so please feel free to contact us with any thoughts you may have. We very much welcome donations of unwanted school uniform (good condition please!). Your donations continue to help us to raise valuable funds for the school. This can be left on Reception (please label bags FOWG pre-loved). Watch this space and ‘Newsflash’ for details of sale events. If you are looking for something in particular, please email preloveduniformwgs@gmail.com and we will see if we can help. Sales are held in the old laundry building – take the drive past the Sports Centre, head round to the back of the swimming pool and the laundry building is on your right after the waste area. Is your child joining Woodhouse Grove in the near future? If so, hopefully this section of our website will give you an insight into what Friends is all about and how we can benefit you and your child as you join our community at The Grove. Please take the time to come along to our events, or even join us. We look forward to seeing you! We know from talking to parents there are lots of questions you have about being parents at the Grove, and also questions about our events or joining our group. Hopefully our FAQ content below answers many of these. Or contact us and we’ll do our best to help! Q. How do I know when to contact Friends and when to contact the school direct about an issue or enquiry? A. Friends is primarily a parents’ association that handles fund-raising and social events. However, we are also Grove parents, and some of our members are also teachers at The Grove, so we’re more than happy to answer any questions about being parents at the Grove. Some enquiries, however (e.g. school bus enquiries, uniform orders, term dates, boarding issues, etc.) may need to be handled by the school direct, and we’ll be delighted to point you in the right direction if you’re unsure who to contact. Q. I’d love to come along to Friends events, but we find it hard to get a babysitter. A. Many parents come along to our events alone, either because they can’t get a babysitter, because partners are unable to come for whatever reason or because they are single parents. Friends events are very friendly occasions and not at all ‘cliquey’, so please don’t worry about coming along by yourself – we’ll soon introduce you to everyone! Q. My child is joining the school in September, but in a higher year group. Can I come along to the Friends New Parents Evening? A. Yes! The New Parents Evening isn’t just for parents of children joining September’s first form – it’s open to ALL new parents. Q. The Parents Information Form sent out by the school asks if my email address can be shared with Friends. What does this mean? A. The school has always asked for parents’ email addresses however this is the first year that email addresses will be shared with Friends. A few years ago we set up our own database of parents’ email addresses, gathered at new parents evenings and via this website, and it’s proved hugely successful – a much more direct way of getting in touch with parents than the notoriously unreliable “pupil post”. Parents on our database are emailed with advance news of ticket sales and events – plus other news like our new online shopping channel. Rest assured your email address will not be shared with any third party and will be sent out as a “bcc” so your address remains confidential. However if you would prefer NOT to receive emails from us you will be given the option to “opt out”. So if this is the case (and we hope it isn’t!) please follow the instructions at the bottom of the first email you get from us. Q. How do I obtain tickets for Friends events? A. You can order tickets by contacting us – it’s never too early to reserve a place! Also, watch out for our leaflets which are sent home throughout the term. Q. Does the school website term diary include details of Friends events? A. Yes. 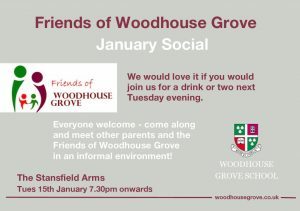 Friends events are detailed under the heading ‘FOWG’ (Friends of Woodhouse Grove). As you will see from the calendar, there’s something happening at the Grove most nights, so Friends have to book their slots well in advance!! Q. I want to come to Friends events, but I don’t have time to join the committee. A. No problem! Friends events are purely social occasions so parents can get to know each other and have a great time. We are always happy to welcome new committee members, of course, but there’s never any pressure to join us. Q. Can I join the committee at any point during the year? A. Yes. You will find the date of our next meeting on this website, so if you’re too busy to get involved at the start of the year, you can come along to one of our later meetings. Q. I’m quite busy but I’d like to join Friends – how much will I be expected to do? A. As much or as little as you feel able to do! No-one is pressurised into doing anything. And please don’t feel you have to volunteer to help at your first meeting – just take it as an opportunity to get to know us and see how things are done. Q. What happens at Friends meetings? A. Our meetings are friendly and informal. We meet two or three times a term in the Long Gallery in the evening to plan and organise events and it’s really a social event in itself. Tea, coffee and biscuits are served, sometimes boxes of chocs too – great fun! Q. What if I can’t attend every meeting? A. No problem – just let us know and we’ll email you the minutes so you’re up to speed with the latest decisions. Q. Can anyone join Friends? A. Yes! All offers of help are welcome and there is no limit to the number of parents that can get involved. So why not come along to a meeting and get a feel for what we do? You’ll find meeting dates listed on this website.